On our last library trip before Christmas, we found some real gems that the we have reread and reread and renewed and renewed. The kids do not want to give these back! Two-year-old Isaac is a sucker for a book with a friendly knight and a dragon or two. 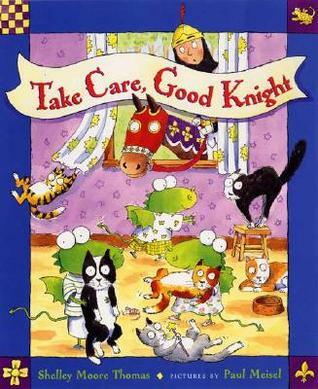 Take Care, Good Knight by Shelley Moore Thomas has three dragons and a knight and some cats. Now that’s a great book. It is a funny tale of three little dragons who try to take care of The Old Wizard’s many cats, but despite their best intentions, get it all wrong until The Good Knight takes command. It’s an amusing story for children and a great introduction to a lesson on asking for help when you don’t know what to do instead of trying to figure it all out on your own. We’re not really at the level of independence where this is a problem–most days, I get more frustrated with the other end of that dilemma. I say things like, “Why don’t you look for it before asking me where it is?” or “you know you can buckle your own seat belt!” But maybe someday, too much independence will be an issue. Maybe. Either way, we love Take Care, Good Knight. This is the first book we’ve read in the Good Knight series. 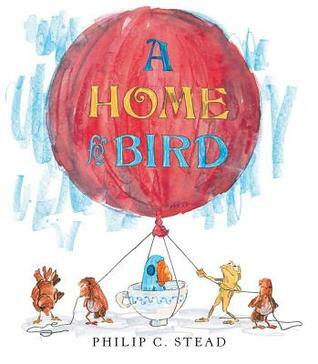 We’re also enjoying A Home For Bird by Philip C. Stead. In this book, a friendly frog finds a forlorn bird that has fallen out of its cuckoo clock. He befriends the bird, not realizing it’s an inanimate object, and spends many days trying to find it a home. The illustrations in this book are soft and inviting, while being very bright and attention getting at the same time. Both children and parents will enjoy it. The poor frog is kind of pitiful, wanting so badly to make his bird friend happy, but you can’t help but love his sweetness. Philip C. Stead was a popular library pick with us last trip! We’re also reading lots of Bear Has A Story to Tell and Hello, My Name is Ruby. What books are your kids loving now?